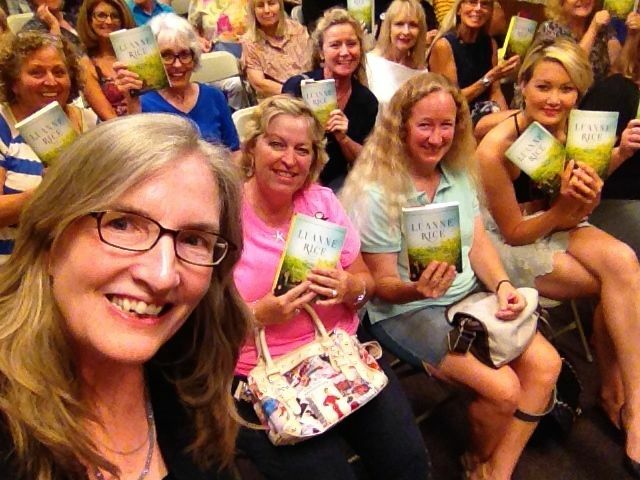 What a great night on The Lemon Orchard book tour! I am very thankful to Warwick's Books in San Diego CA for welcoming me back again. This wonderful independent bookstore is a haven for readers and writers. The evening started at dinner at La Valencia where I got together with dear friends (from left) Andrea Boyles, Mike McIntyre, and Phyllis Boyles. They live here in San Diego, and I was really overjoyed to hang out with them and walk over to Warwick's together. Mike is a writer, and I'm a huge fan. I was thrilled and honored to see my friends from Water Station. They save lives by placing water in the desert, where migrants cross the border. I volunteered with them, and my life was forever changed. The work they do is very like that of Louella, in the novel. Armando, on whom the character Roberto was based, once told me that while crossing the border he dreamed he died of thirst. Then he dreamed of an angel who brought him water. That very well could have been the people who work with Water Station. From left: me, Paula Poole, John Hunter, Laura Hunter, and Brett Stalbaum. Rachel Hartwig is an incredible reader, and I am so lucky to know her. She and her husband Mike drove all the way from Nevada to see me tonight. Not only did they travel a long distance, they brought cheesecake for everyone at the bookstore! What generosity. Here are Rachel and I with what was left of the delicious Aphrodite cheesecake from the Market Grill Cafe. I loved meeting Deborah and Amy and their daughters Adilee and Madelyn. As Deborah wrote in a note to me, "Amy and I have been best friends since we were sixteen, living in Vacaville, CA. Over the years we have shared our love of books--mailing them to each other and sharing our favorite books and authors. Three years ago we were able to become neighbors after twenty-four years of friendship. Now our girls trade books too." From left, Amy Josse, Deborah Walters, me, Adilee Walters, and Madelyn Josse. Julia Jones (left) and Suzy Cox were college roommates at the University of Texas. They were wonderful to talk to; they wanted to hear the details of how I was inspired to write the love story between Julia and Roberto, and as sometimes happens at book signings, there was an incredible magic in line when I confided in them, and they in me, and we had a best friends moment. Evelyn Goodwin and Phyllis Hansen, shown separately in these two photos, drove together from a town east of San Diego. They were so kind and supportive, and we had a chance to talk for a few minutes before the even began. I was thrilled to see my friend and fellow author Machel Shull tonight. It's her anniversary week and I know she made a very special effort to come see me. Machel has interviewed me for her column in The Coast News, and I gave her a quote for her book. She is a wonderful, kind, dear person; it was really great to reunite at Warwick's with her and Rachel--because this is where they first met, as my readers, now friends on Facebook and in life. And congratulations to Machel on finishing her second book--I'm sure it will be as insightful and soulful as her first. Mitch Little came! He was a great friend of my sisters and me when we were all young in Connecticut. We knew him from Essex and Fenwick, where his family had a house, so it was really amazing to see him and his wife Stephenie a continent away in San Diego. I spotted him in the crowd and would have known him anywhere. Group shot of old friends and new friends--the incredible people from Water Station and the UT roommates. From left, Brett Stalbaum, Paula Poole, me, Laura Hunter, John Hunter, Julia Jones, and Suzy Cox. Here is Julie Slavinsky, Warwick's director of events. She gave me this Warwick's special label bottle of wine, but even more, she gives writers and readers a chance to gather, to exchange ideas, to support each other. She has such warmth and kindness--qualities that mean so much to writers on book tour. I am incredibly grateful to Julie and everyone at this great independent bookstore. At the end of the event, we took an Ellen Selfie. I thank everyone who showed up--on a gorgeous summer night, in the resort town of La Jolla, when they could have been doing anything else--looking at the moon, walking on the beach, dancing the night away--but instead came to the bookstore to hang out with me. I had a great time, and it was because of you. Now that The Silver Boat is on sale, I have the pleasure of being on book tour, meeting readers along the way. I had a great kick-off event at R. J. Julia Booksellers in Madison CT. R.J. Julia has supported my novels since the early days, and I'm incredibly grateful. They took a chance on me relatively early in my career, promoting my novels and asking me to read. There have been other constant supports along the way. The Phoebe Griffin Noyes Library in Old Lyme CT is one--every summer for many years, whenever I had a new novel out, librarian Mary Fiorelli would create a wonderful, imaginative event--I would read or give a talk, sometimes by the fireplace in the library's wonderful reading room, surrounded by paintings done by American impressionists, members of the Old Lyme art colony. Writing a novel is its own kind of magic. But the enchantment goes to a new level once the book is in the hands of a reader. I'm so grateful to all the booksellers and librarians who have helped bring me and my readers together. It's incredible teamwork all around. I would love if you'd leave a comment here, telling us about your own favorite bookstores and libraries. I'll be appearing in Charleston SC at the Post & Courier Book and Author Luncheon on April 21st. Between now and then I'll be guest-blogging, doing radio and TV interviews, including Better TV--my segment airs tomorrow, 4/13; please check their website to find out where you can see it in your area. After Charleston, my book tour will take me out west. I'd love to see you! Thank you in advance to all the wonderful book people hosting me and coming out for The Silver Boat. Yesterday I spent the day at the ALA Midwinter meeting. Early in the morning I had breakfast with booksellers. We met at the U.S. Grant Hotel, and the conversation flowed instantly. Put book lovers and coffee together and off we go. We talked about The Silver Boat, and I was thrilled to hear they plan to recommend it for book clubs. I love and am honored to know that readers discuss my novels, using my stories to reflect on issues in their own lives. No Woman is an Island; that's my motto. Publication of The Silver Boat, once seeming forever-off, is just around the corner in April. It was wonderful to convene with such great book people. Tom Benton of Penguin (a recipient of Publisher Weekly's Sales Rep of the Year award) organized the breakfast, where nourishment came much more from the booksellers' warmth and love of books and my appreciation and love of booksellers than the (absolutely delicious) muffins. Heading to the Convention Center, I was greeted by the elegant, kind, and incredibly delightful Dominique Jenkins, whom I absolutely adore, and who did so much to ease my day and welcome readers to my booth signing. She stayed so vigilant on my behalf, waiting to hear from a friend trying to park outside, guiding her (a Facebook friend turned actual friend) Machel Penn Schull, through the maze of displays so we could finally meet. Machel is a talented, dear-hearted, compassionate friend and writer. The Penguin booth was a haven where along with Dominique, I got to hang out with Howard Wall, instant best-friend since the Penguin 75th anniversary party at Vroman's and the Keeper (librarian in his own right) of Penguin History; Alan Walker (rock star when not overseeing major events such as ALA...humble rock star at that; it took my mentioning guitar lessons for him to tell me just a little of his music life. The man and his band have played everywhere,) and the luminous, efficient, and visionary Tanya, with whom I enjoyed deep conversation between signing copies. Publishing people are angels, pure and simple. Many visitors to the booth commented that it was great to know that I'm back at Viking, working with Pam Dorman. Over and over I heard how wonderful Pam is (it's so true,) and people who know our history together remarked that Pam knows me so well, and is doing such an amazing job publishing The Silver Boat. I couldn't agree more. Hildy Barger, one of the first people in line, told me I was her favorite writer, completely making my day and causing me to hand Dominique my camera and ask her to take Hildy's and my picture. The librarians! Many stopped by to talk about and pick up signed advance-reading copies of The Silver Boat. They were so kind and enthusiastic, and I thank them all. Two have inaugurated what I believe to be The Silver Boat's first official Book Club selection. Here we are, Robin Hoklotubbe of the County of San Bernardino Library and her friend Carole Macias. They belong to the Girlfriend Book Club in Corona, CA, and I'm so excited to know they've chosen my novel to discuss. Another librarian told me she has sisters and is going through something similar to the sisters in The Silver Boat, having to do with the death of their mother and the sudden reality of being left with her house, a place where they'd all gathered and been happy, spent holidays together, and now what? Having gone through that situation in my own life, I've drawn on it in fiction. I was happy to meet Meredith Myers of StandUpLibrarian.com, whose business card reads, "So a comedian walks into a library and decides to work there. "She wore the cutest hat. She's not your grandmother's librarian, but then again, who is? Librarians are hot. That's the truth. At one point I was interviewed and asked who my current favorite librarian is. Very difficult question. But Amy Rhilinger of the Attleboro (MA) Public Library is up at the top of the list. Amy uses her art and creativity to enhance the reading experience; recently she instituted a poetry program for middle schoolers, and any librarian who gets an eighth-grader into W.B. Yeats, Mary Oliver, Charles Bukowski, fringe poets, romantic poets, haiku poets, activist poets, any poets-- is great by me. After the tea, it was great to speak with Carol Fitzgerald. Founder and president of Bookreporter.com, among other sites, Carol gives so much time, wisdom, and support to writers and readers, bringing us together. She is dynamic and wonderfully warm, and I only wish we'd had more time to spend together. P.S. I love our surprise visitor in the photo, but she was on her way before I could get her name. Hi! I love you.